Either side of the Grand Canyon, the Colorado River is dammed forming two huge artificial lakes; Lake Powell in Utah and Lake Mead on the Arizona/Nevada border (named after Dr. Elwood Mead, Bureau of Reclamation Commissioner from 1924 to 1936). This began filling in 1935 following the completion of Boulder Dam, later designated the Hoover Dam after the 31st president, across the river at Black Canyon, 25 miles from Las Vegas. Indeed, it was the construction of the dam and the arrival of thousands of workers which prompted the legalization of gambling in Nevada and the consequent growth of the city. 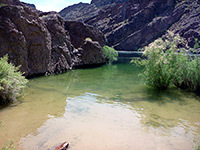 Before the dam, this area of the Mojave Desert in northwest Arizona was largely unvisited due to the harsh, irregular terrain, the lack of roads, and the extreme summer temperatures. Now, the lake forms the major component of Lake Mead National Recreation Area, 1.5 million acres that extends quite far south and includes 25 miles of the Colorado River plus the smaller Lake Mohave, formed by Davis Dam near Bullhead City. 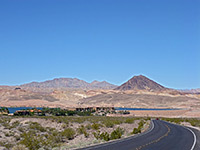 The nearest towns with hotels close to Lake Mead are Boulder City, Henderson, Las Vegas and North Las Vegas, while Bullhead City is near to Lake Mohave. Follow the links for hotel information and reservations. 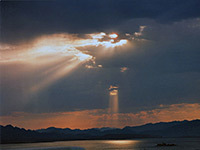 Lake Mead flooded a large area of desert, covering many canyons, several small towns and many relics of ancient settlements. It is not necessarily a compensation, but this inundation has created a major Southwest attraction which now brings many thousands of visitors each year. They come for boating, fishing, jetskiing, camping, swimming and to a lesser extent hiking - outdoor activities are possible year round as the weather is usually sunny and hot, up to 110 °F in midsummer when the water temperature reaches the mid 80's. The scenery is impressive enough - clear blue water beneath gaunt rocky cliffs, but much can only be appreciated using a boat as the majority of the innumerable sheltered coves and flooded canyons, often with clean, empty beaches for camping, are quite inaccessible by road. 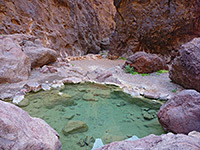 In general though most of the surrounding land is rather nondescript desert - dry washes, desert plains and low, rugged hills, so the area is not as scenic as Lake Powell, and as there are very few official trails, Lake Mead NRA is not a major destination for hiking and exploring, but rather just for the water-based activities, which are concentrated along the 20 miles of the southwest shore, close to Las Vegas. In recent years the amount of water in the lake has decreased steadily, due to drought; the reservoir is less than 40% full, the surface level has fallen by over 100 feet, and the upper margins of the lake, along the Virgin and Colorado rivers, are several miles closer to the dam. 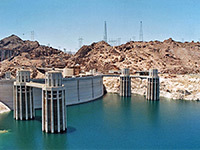 There are rather more access points to the shoreline of Lake Mead compared with Lake Powell, especially the section northwest of Hoover Dam in Nevada which has various beaches, camping areas and marinas. Highway 167 (Northshore Road) runs fairly close to the water for 40 miles passing through colorful, empty, desert surroundings with around a dozen side roads of varying quality leading towards the water of which one is to a developed marina, at Callville Bay. Two other marinas have ceased operations due to the decreasing water levels - Echo Bay in 2013 and Overton Beach in 2010. The road to this latter location is closed, though there is another route just to the north, which leads to the site of St Thomas. 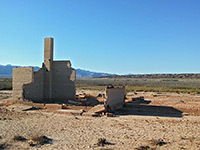 This small town was abandoned in the 1930s when Lake Mead was formed, and was for many decades flooded to depths of up to 60 feet, but now the various foundations and ruins sit once again on a dry, flat, bushy plain, half a mile from the Muddy River. A trail runs around the old townsite, and a detailed visitor guide is available. 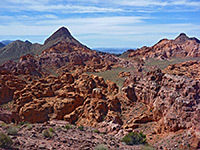 The nearby desert on the Nevada side of the lake is characterized by gaunt mountain ranges with occasional bright red or orange sandstone outcrops - Valley of Fire is the most spectacular, but also worth exploring, though harder to reach, is the Bowl of Fire, a few miles north of the road near the Callville Bay turn-off. 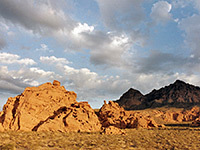 Another scenic red rock location is Whitney Pockets north of the lake, near the Virgin River. But the most visited section of Lake Mead is that closest to Las Vegas - here are two large marinas at Boulder Beach and Las Vegas Bay, plus campgrounds, beaches, picnic areas and the main NRA visitor center. The proximity to the city and ease of access means that the beaches and overlooks hereabouts tend to have a lot of litter. beside the Colorado River, where the Grand Canyon begins (or ends). However, the northeast section of shoreline between the Virgin and Colorado rivers remains virtually unvisited - it may only be reached by driving along many miles of rough dirt roads across the Shivwits Plateau in northwest Arizona, land which is part of the new Grand Canyon-Parashant National Monument. The west side of Lake Mead has a number of free primitive campsites along tracks forking off Northshore Road, for example at Stewarts Point, near Overton Beach at the north end of the lake. Here, camping is allowed on a large area of the shoreline, which is flat, sandy and sheltered. Sites nearer Las Vegas tend to be crowded and full of litter but far fewer people drive further north so camping here is very peaceful and secluded. Official (paid) sites for tents and RVs may be found at all the marinas, and are charged at $20 per site per night (in 2016). In Nevada, the nearest places for primitive camping outside the NRA, and so free of any regulations, are along dirt tracks leading into a range of low hills either side of NV 169, a few miles north of the turn off for Valley of Fire State Park. There are very few maintained paths in the NRA, though hiking opportunities are numerous. The majority are cross-country, off-trail routes - destinations include narrow canyons, rock art sites, springs and rock formations.